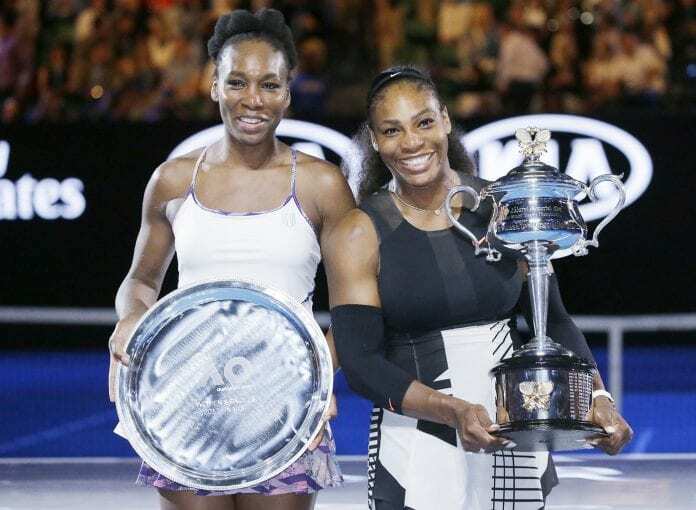 Venus and Serena Williams pose holding the winner and second place trophies at the Australian Open Saturday. Serena’s win gave her a record 23rd Grand Slam titles in the Open era, tops among men and women players. The Williams sisters first faced each other in a Grand Slam event back in 1998, and it was at the Australian Open. So it was only fitting that Saturday that would be the place where Serena Williams won her record-breaking 23rd Grand Slam title, and against her sister. Venus Williams had been the surprise story of the open until that match, making her way through the draw and reaching her first final in nearly nine years. But Saturday, while she gave her sister Serena a very competitive match, in the end it was Serena winning 6-4, 6-4. That title breaks Serena Williams’ tie with Steffi Graf, and gives her the most majors of any one in the open era. Margaret Court holds the alltime record with 24, set when there was rigid separation between amateurs and professionals. With three more Grand Slam events to go this season, including two (Wimbledon and the U.S. Open) that are on her strongest surfaces, Williams is more than even money to get Court’s record this season. The victory also puts to rest any fears that Serena Williams was starting to slip after the tail end of last season. During that time she was defeated in the U.S. Open semifinals and also lost the number one ranking. She ended the year prematurely citing an injury. Then in her first tournament of the season she had a very lackluster performance. Williams was bounced in the first round at Auckland, losing in three sets to fellow American Madison Brengle, someone that she had previously routed in easy fashion. Williams also had 88 unforced errors in that match. But she was sharp throughout the Australian Open. In addition, she also regained the top ranking as previous number one Angelique Kerber was defeated prior to the semifinals. That she was back at number one came as a surprise, since her coach Patrick Mouratoglou had told her there was no way she could regain it even if she won the tournament. Next up are the Italian and French Opens, though the Italian is not a Grand Slam event. The French Open on clay has always been Serena Williams’ least favorite, but she has won it multiple times.